Come to the Peachland Public Library to participate in an exciting World Record attempt! 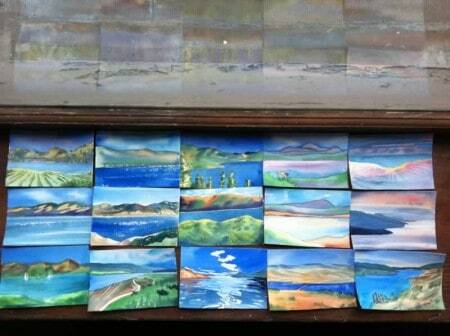 The Kelowna Art Gallery is attempting to create a new world record for the most 4″x6″ original landscapes in one place. On Saturday, January 21st from 10am-11am, I will be at the Okanagan Regional District Peachland Branch Library to facilitate an art session. Bring your own art supplies if you have them, however there will be paper and art supplies free of charge for you to use. All you have to do is come! 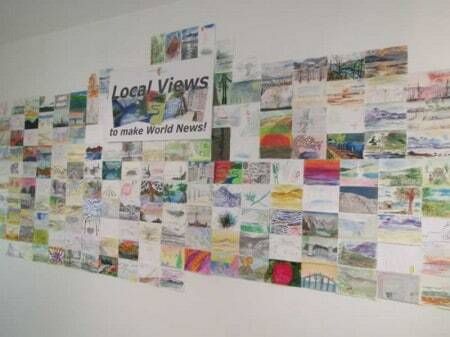 It’s a free event where you can get inspired to paint or draw your 4×6 entries. If you‘d like to create some entries at home ahead of time, bring them in and I will deliver them to the Kelowna Art Gallery for you! You don’t have to be an artist to participate! 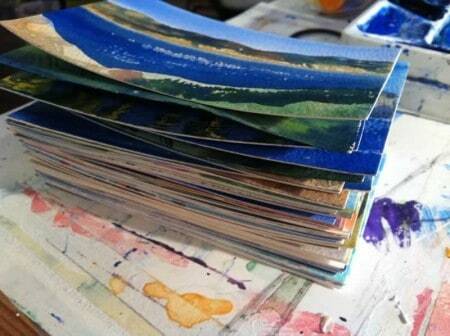 The only “rule” is that the artworks have to be 4”x6” Okanagan inspired landscapes on paper. Your entry can be created with pencil, charcoal, crayon, felt, pencil crayon, paint, or collage! Are you on Facebook? Visit my facebook page to see more photos! On July 13th I was signed up for a free call for my life coach Beth’s Inspired Speaker Series. Every month she interviews one of her mentors, colleagues, or friends and anyone can join in to get inspired. On July 13th I was especially interested in the call because the Inspired guest speaker was one of my own graphic design clients, Angel Therapist Deborah Wilson. One of things that Deborah talked about is how each and every one of us has the ability to tune into our spiritual intuition. Have you thought about one of your friends out of the blue and then received an email from them an hour later? Or have you ever said you were going to do something and then, without even seeking it, receive exactly what you need to move forward? Deborah calls these intuitive thoughts ‘spiritual downloads’ and she believes that you can learn how to tune into them and grow your spiritual awareness. On the call I couldn’t think of a question to ask (at first) but I did speak up and say that I love the thought of the Universe starting to conspire in our favor when we put something out there. Deborah says that the Universe is always trying to conspire in our favor but that it’s up to us to allow it to do so. She says that when we ‘make a decision’ we are coming into alignment. When we get ‘really clear about something we want’ it almost seems like we instantaneously get what we asked for. Part of me believes in the power of the Universe and part of me believes that it is about creating a state of awareness. If you have your head down and you are only thinking about the negative aspects of your life, then you might miss out on seeing opportunities as they arise. Whereas if you keep your head up and you are clear about what you do want to create a more positive life for yourself then you will naturally be more aware of these opportunities as they come your way. If you would like to comment on this or any of your own experiences, I’d love to hear your thoughts. To find out more about Deborah Wilson you can visit her Angels and Prosperity Facebook Page or her Angels and Prosperity website. To sign up for the Inspired Speaker Series and gain free access to the recording of Deborah’s call on Spirtual Alignment (the one I am on) you can go to Beth’s Inspired Speaker Series webpage. This week I experienced firsthand the power of saying goals out loud. When you say a goal out loud the Universe immediately begins to conspire to bring that goal to life. For example, last week I said that I was going to try and drum up some graphic design work and I made a plan to call one of my old clients the next day. When I sat down at my computer in the morning there was an email in my inbox from that exact client and I hadn’t even called him yet! Did my saying it out loud make it happen? I don’t know, but I love the idea that it could have. I’m tempted to believe it did. There’s more. That very afternoon my lifecoach introduced me to one of her friends who needs some graphic design work done on her website! I did not even seek this out! All I did was say out loud that I wanted to do more graphic design work, and ta da! the Universe hands me 2 clients the very next day! This gets even better… last night my studio partner and I said that we want to expand our territory and then today I met for coffee with one of my friends that I graduated with a few years ago and she is opening her own gallery! She invited my studio partner and I to be two of the artists in her gallery Wine Valley Accents! If all of this can happen just from saying my goals out loud, imagine what will happen when I start to write them down. I was a feature artist at Art Walk this weekend at Sun Peaks. Just before 2:00 we got word that the final count was 33 tickets sold so there would be two groups. Peter Ernst started preparing the food tasting at Bella Italia. We were lucky that we weren’t the first restaurant on the tour because our wine rep was hosting a seminar until 2:30. Shortly after he arrived our first tour group walked in. The tour guide introduced me and I gave a short presentation. I told everyone that I lived at Sun Peaks for two winters 12 years ago. I said I think I would have been voted least likely in my highschool to become a snowboard bum. I was told I could be anything I wanted to be, but I just knew that the perfect career was out there for me somewhere and I just didn’t know what it was yet. I felt like one day it would appear to fall into my lap, but no one would see all the little steps that took me there in my life. Sometime you can follow a path in life to your dream even if you are not sure what your goal is. As long as you follow your heart you will be going in the right direction. At that time my roommates and I couldn’t afford art for our walls, so we decided to paint our own. My first painting was of a snowboarder jumping off a cliff. I even made ten small postcards and sold a few of them for $5.00 each at what used to be Bags Chocolates in the Village. 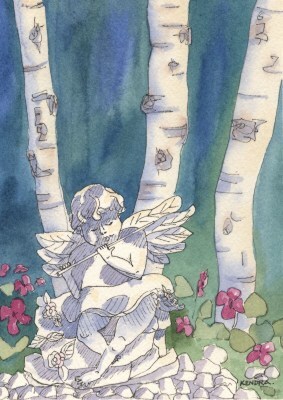 After I moved away from Sun Peaks I took a watercolour lesson and I was instantly hooked. I love painting. I feel so grateful to be leading such a creative lifestyle. When you have a passion you will never be bored, you will never be lonely. It is a great way to live. I answered several questions and then the wine rep presented the wines for the wine tasting and food pairing as the Italian pasta was served. Bella Italia provided me with a delicious dinner that night and Sun Peaks Tourism and Sun Peaks Lodge paid for my hotel room. This made my day. I really appreciated being taken care of like that. I have been painting for ten years and this is like a dream come true. I’ve always wanted to be a guest speaker. To have my accomodation taken care of was such a treat. 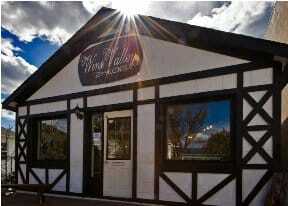 Thank you Bella Italia, Sun Peaks Tourism and Sun Peaks Lodge! A big thanks too to Tree Line Studios who organised the Art Walk event and hosted us on Sunday in front of the gallery. Follow your heart and your dreams can come true too. The chapter on persistence in Napoleon Hill’s book “Think and Grow Rich” really strikes a cord with me. Hill defines persistence as “the sustained effort necessary to induce faith”. In week two of my ten week action course we learned that the key to success is persistence. Hill writes that you must have a crystal clear picture of what you want and a plan to achieve it. Focus on creating a timeline and acting on your plan with persistence. Hill aknowledges that most people are ready to “give up at the first sign of opposition or misfortune. A few carry on despite all opposition, until they attain their goal.” It’s so true. Where many have equal opportunity it is those who persevere who attain their desires. We have all heard the expression “get back on the horse” but do we really understand and apply it in our own lives? My friend and fashion designer Kim Cathers says: “I think life is all about being torn down and broken down and then building it back up again. And what you have in the end will be bigger and stronger than what you ever had before.” That is huge. In every book and course I have taken on success, the theme is consistent: Have a clear goal of what you want. Taking this further, when you write down your goal you will have a more powerful intention to complete it. There is even a book called “Write it Down, Make it Happen” by Henriette Anne Klauser. In her book, Klauser tells stories of unbelievable dreams coming true after they have been put down on paper. The law of attraction states that not only must you think positively of what you desire, but you must also feel as though you already have it. Being open and ready to receive your dreams is sometimes more important than the journey to get there. Be in a constant state of gratitude for what you already have in your life and know in your heart that your dreams are going to come true. So follow your heart. Seek your dream. Chase your desire. Write down your goals. If you believe in yourself and follow your dreams then you can achieve anything you set out to do. Aim high; you don’t need luck, you just need faith. Where are you in life and how did you get there? Nothing happens by accident. Focus on where you are going next. Have a crystal clear picture of what you want. Read your mission statement every day. Have a time line for your goals. Develop a plan to achieve your goals. Have no limits ~ Do not let limits stop you. Don’t expect too little out of life. For many artists, designers and art galleries, sales may be down this year. Even though the sales aren’t as high, many people are still looking and this is what we have to take heart in. Many of the orders that I got this November were from people who had been to one of my art shows from FIVE years ago! In these slow times we must remember that we are laying the foundation for our future. When I lived in Fernie, BC I noticed that the whole town’s mood was dependant on the weather. When it was summer and sunny everyone was happy. When it was winter and snowing everyone was happy. Those were the busy times. Those were the days when people were making money. At all other times of the year and in bad weather, the whole town seemed to sink into a mini depression. It was a very interesting experience. A phenomenol thing happened to me during these slow times: I would buckle down and get to work. Hooray! Finally some down time when I could paint and produce! Refill the shelves, stock the galleries, build up my inventory. For me it was a big relief to have the off season. I was never bored. It is such a blessing to have a passion and to live such a creative lifestyle. So for those of you who are feeling these hard times, relish in the fact that these are the days for you to go to work. Creativity is good for the soul. Laying the foundation is good for your future. My philosophy is that a positive outlook will bring you great things in life. If you have a negative mind set, then your head will be down and you will miss out on the chances life brings you. As long as you have a positive attitude and keep your chin up and your eyes and ears open for opportunities, then you will end up on the right track. By taking those opportunities you will be taking steps towards your big dream. Nothing will get accomplished if you just sit back on your heels and wait for life to happen to you. Get out there and get moving – start doing, and pretty soon you’ll be doing something you love. To the world around you, it will look like everything suddenly fell in your lap, but they won’t see all the hard work, determination, and little steps that brought you to where you are. Now that you have your dream in your lap, it may or may not suddenly dawn on you how all those opportunities you took were little important steps that helped shape you. But this is just the beginning… now you can set real goals and prepare for an even bigger and better dream for yourself than you could have imagined! I actually made this background image twice. The first time it looked more realistic, and then I redid it from scratch to give the picture a more artistic style. To see the “before” illustration click here. To make the flowers look so realistic I used the live trace tool in Adobe Illustrator which essentially creates a vector out of a photograph for you. Then I played with blending and shading it in Photoshop. The “after” illustration was made from scratch (I traced the photo myself using the pen tool, not the live trace option). I created the flowers using Illustrator, and then I brought the image into Photoshop to do the shading and add highlights. See the full finished version here. The apple trees are in blossom in Kelowna and it is so beautiful. I was so happy to have a chance to go exploring around the city when my friend and fellow artist and designer, Samantha Walsh, came to visit me. We had great discussions about graphic design, art, and life. Spring time is so rejuvenating. It feels great to get out in the sunshine. It was a great day for a hike too.